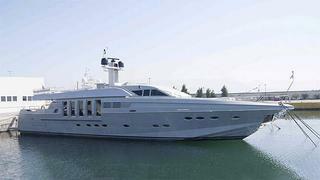 Michel Chryssicopoulos at Cape4 Yachting tells me he's just signed the 28.45m motor yacht Protect 136for sale. Built to RINA class in 1999 by Posillipo, she was refitted in 2008. Accommodation is for up to nine guests in four staterooms and twin 1800hp MTU engines give her a range of 330 nautical miles at her cruising speed of 25 knots. Lying in Greece, Protect 136 is asking €1.36 million, VAT paid.